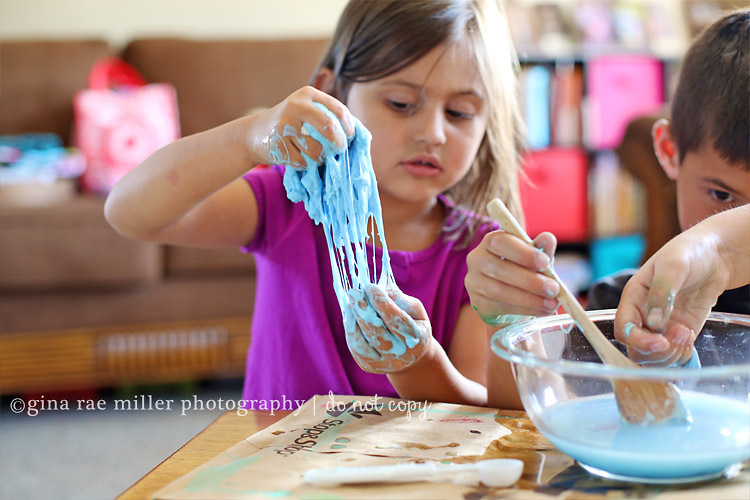 I know they love slime and clay and dough and anything they can mush around, shape and that Mom generally wouldn’t buy them at the store (I’ll buy Play Doh though. 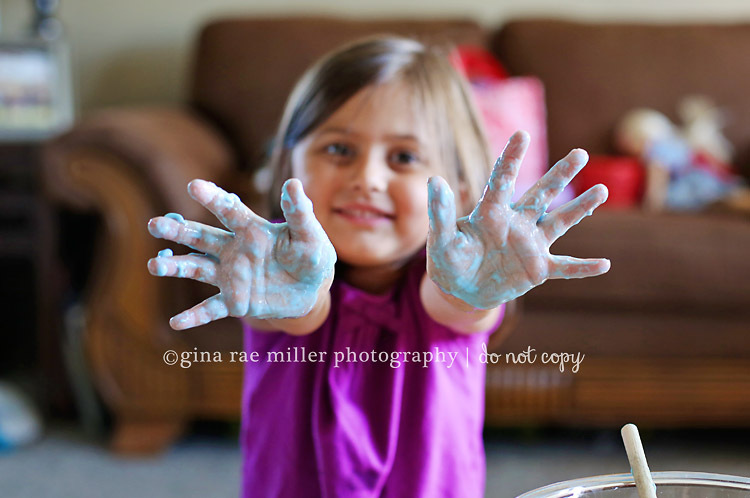 Nothing in this world smells as magical as Play Doh). 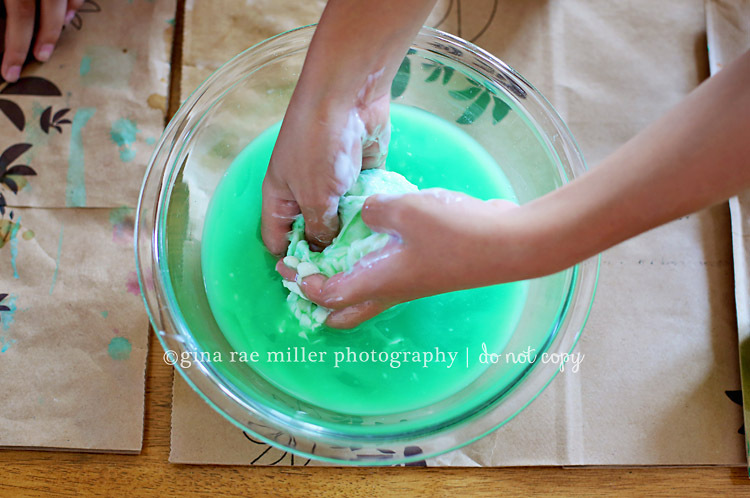 I figured a gak/flubber of some sort would be cool. I found a very easy recipe and had all of the ingredients on hand. We had two batches made within a few minutes. Here are my cute little monkeys and the supplies you will need. 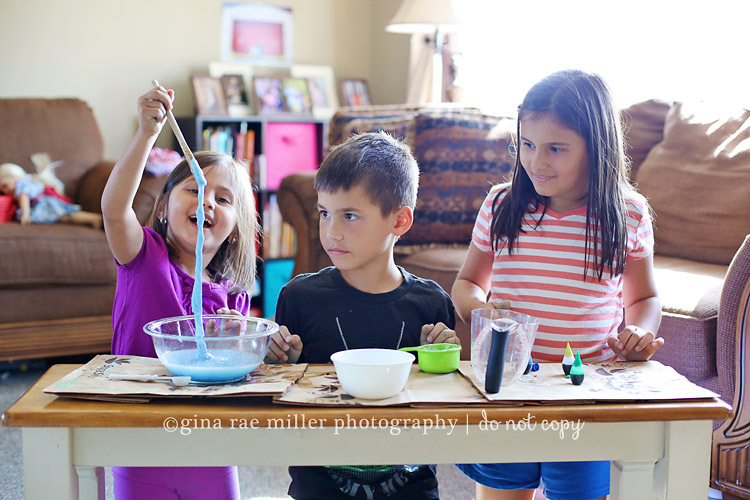 And just a little note: the pictures below are all over the place as I mixed blue slime and green slime pictures all willy nilly. If this sets your OCDed-self in a twitching fit as it does me, I apologize in advance. First, kid #1 (we made two batches so they changed jobs mid-slime making) poured the teaspoon of borax into one cup of water (reserve the remaining half a cup for later). Stir to dissolve. Set aside. 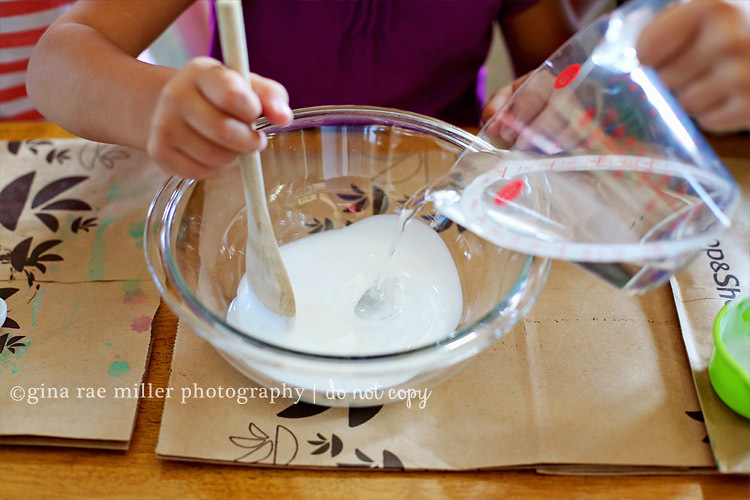 Next, kid #2 poured the Elmer’s glue into a large bowl. 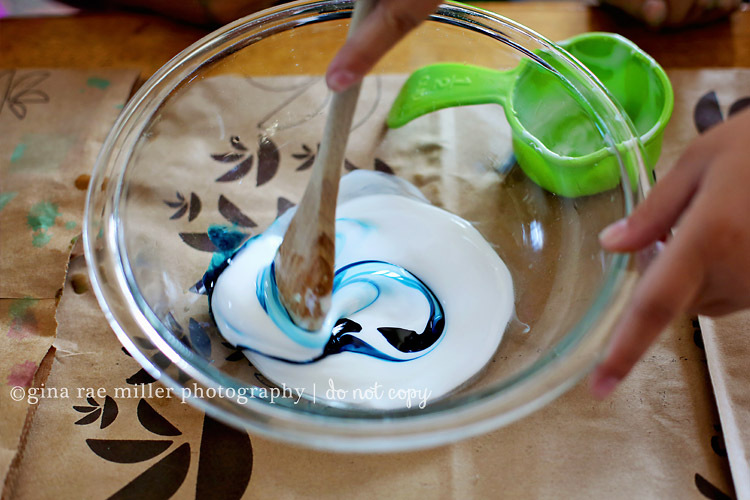 Now, the first batch we made, we added the water and then the food coloring. The color wasn’t taking so well so we did it a little different on the second try. 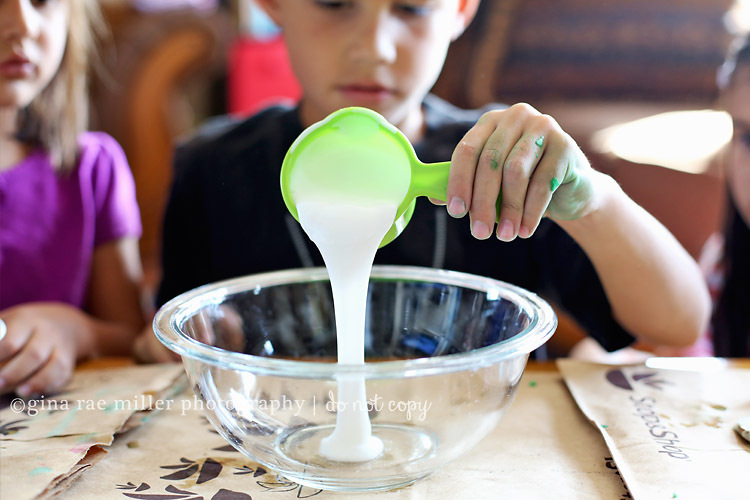 After we poured the glue into the bowl, kid #3 added a few drops of food coloring right into the glue. We recommend doing it like this. Add the remaining 1/2 cup of water and stir. It’s a watery mess. Now here’s the stage where it all comes together. 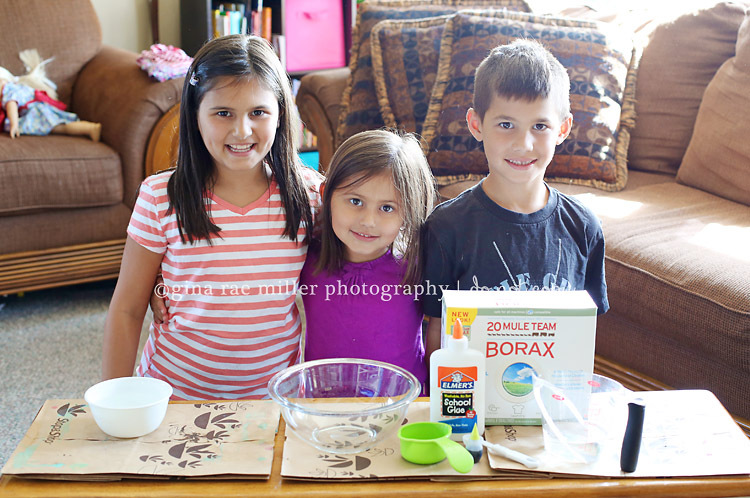 Slowly pour the borax water into the glue water, making sure to scrape the bowl because some of our borax settled. Stir, stir, stir and watch clumps form! The kids used their hands and searched around the bowl for the clumps. 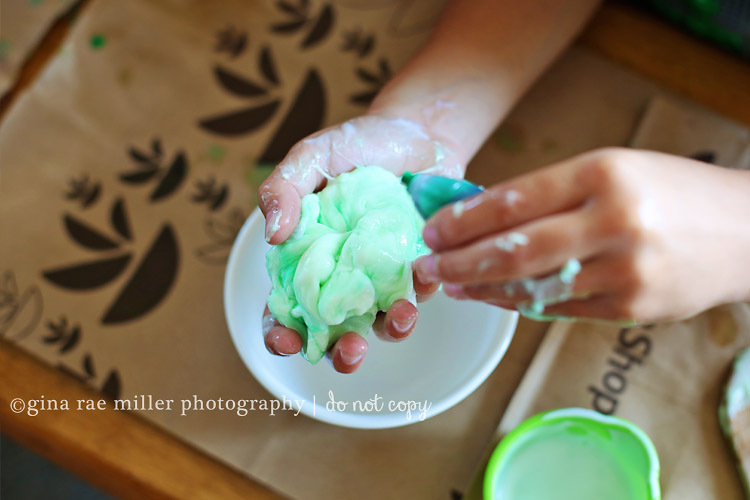 We mushed them all together and then they each took a turn stretching and kneading their slime. **NOTE: You have a LOT of water leftover. Just discard this. The entire water mixture is not supposed to turn into slime. 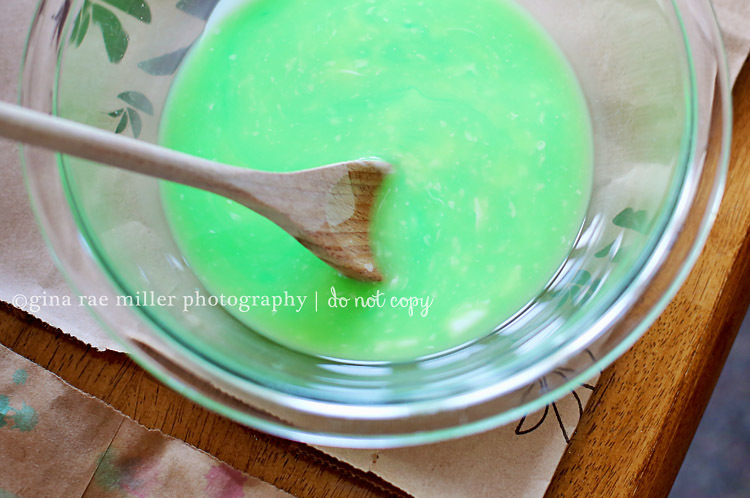 Make sure to scrape any bits of gak from your bowls and spoons and toss into the garbage. I’m pretty sure it’s not the best idea to have this stuff clogging your sink drains. I did not want to experiment in this department. We stored our two batches in small zip-top bags. I have no idea how long they’ll stay fresh. I tried to keep them as airtight as possible. 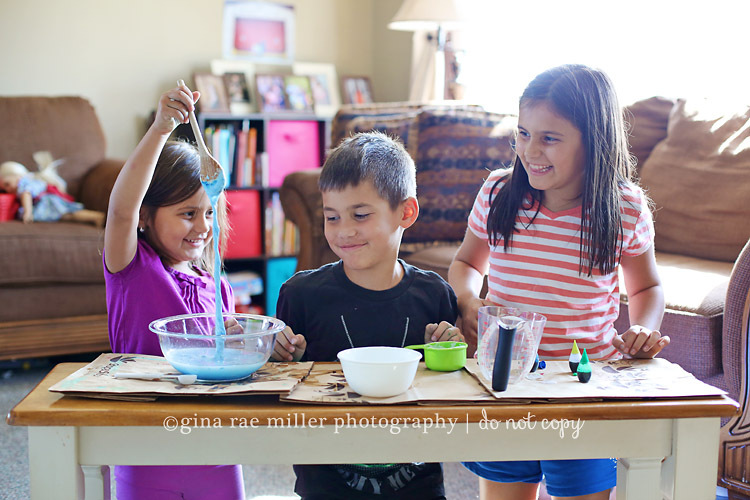 The kids are getting a kick out of their gak though! They even discovered it bounces!